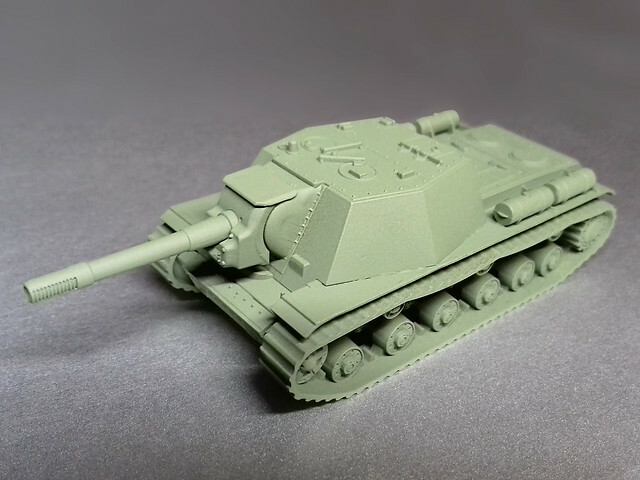 Diary of a novice scale model maker and his adventures in the wacky world of Braille Scale. 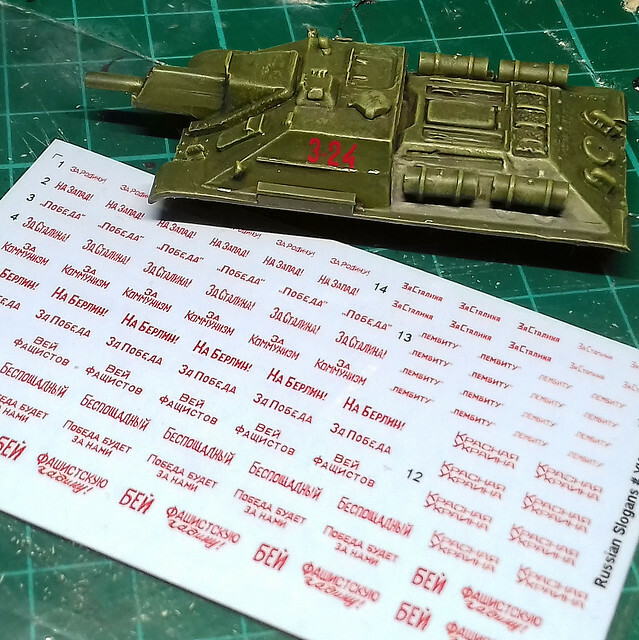 My 1/100 WW2 Soviet tank force has been on hold while I awaited the arrival of some additional decals that I ordered. I'm glad to say that they have now popped through my letterbox! These 1/144 Red Army slogans are the same as the white versions that I used on my 1/100 T-34s...But red (in both senses of the word)! 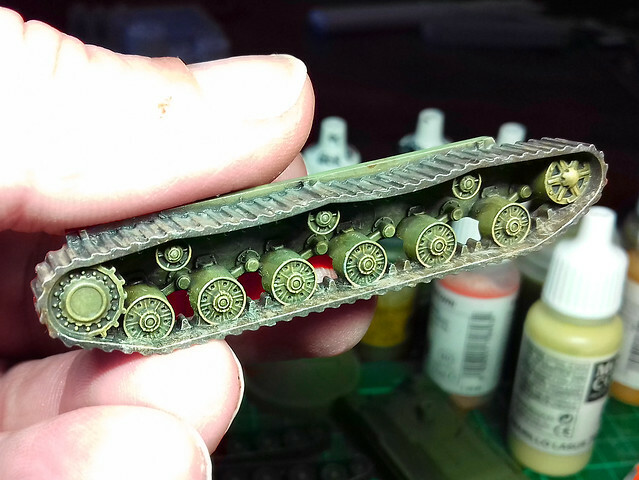 I'm trying to get both my T-34s and SU-122s to the same point in their painting so that I can do the next couple of stages in their weathering together, hence the wait. 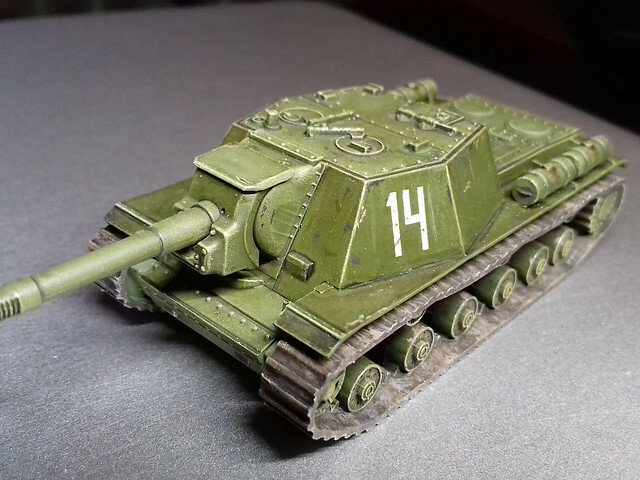 I wasn't really satisfied with the red number decals that I had applied to this SU-122, I thought the tank looked a little mundane and needed a little something extra. So when I realised you could get the Red Army slogan decals in red I ordered them straight away (though, stupidly, I opted for second class postage which is why they took so long to come). The decals are by 1/144 Direct in Glasgow. I just have to decide which slogan to add to my SU-122 (just below the numbers)...? 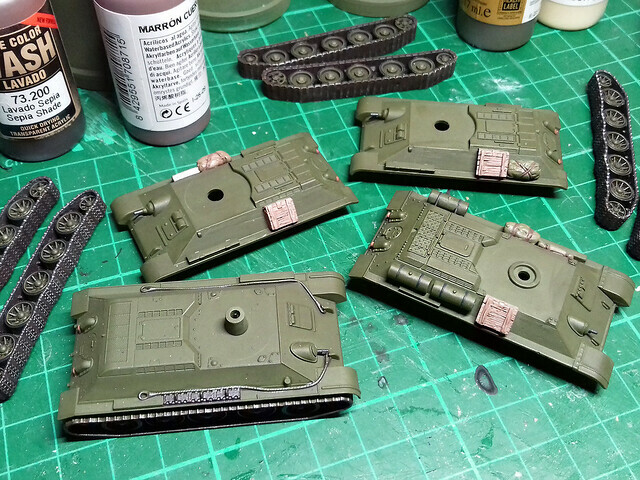 Next: Weathering my T-34s and SU-122s. 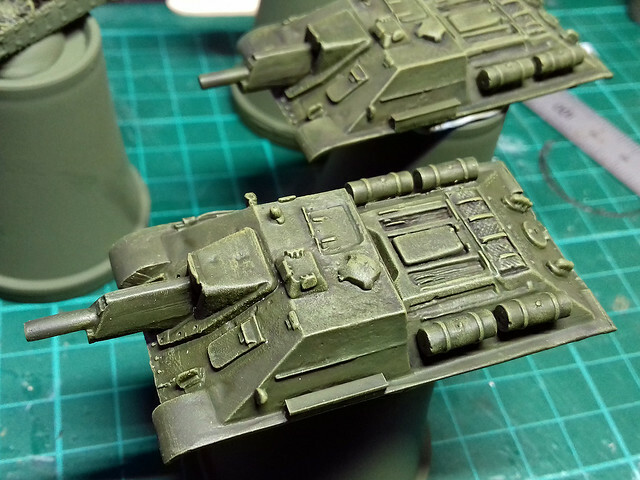 Moving on from the priming, I've applied my now standard wash procedure for WW2 Soviet armour. A dark staining wash of Citadel Agrax Earthshade, followed by a light dry brushed highlighting of Vallejo Model Color Yellow Ochre. 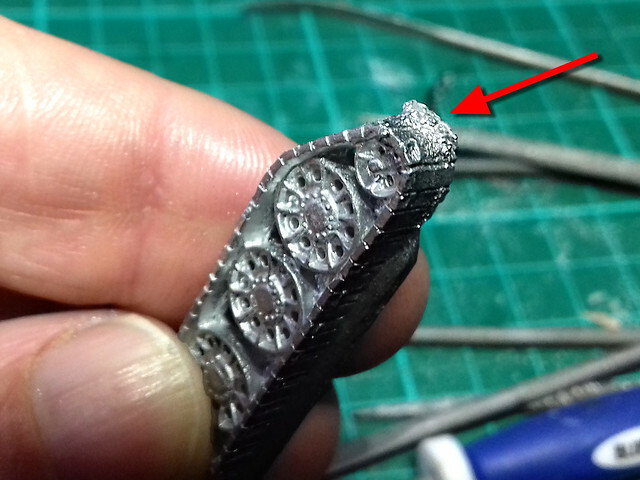 It just picks out the raised edges and corners and gives some small amount of 3-D tonal contrast on raised detail. At this stage it does look a little in your face (though I have seen some war-game modellers who like 'high contrast' stop at this point), so I prefer to take a step backwards - of sorts - and smooth out this contrasty highlighting with a overall modulating wash of diluted Vallejo Model Air Russian Green. faint mottling of the darker shades showing through. 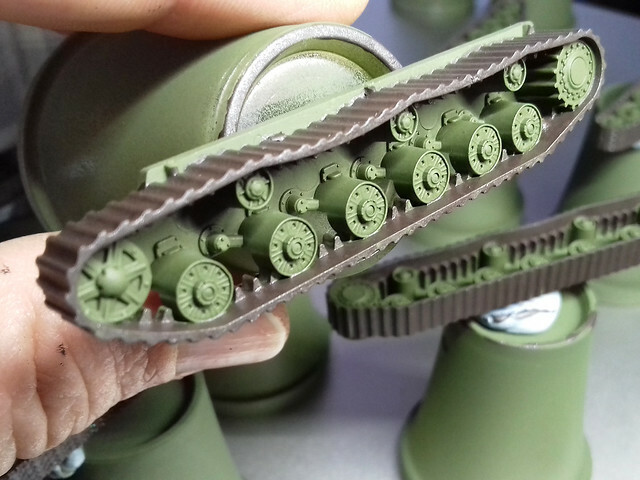 In a way I am sort of a fan of the opposite of the airbrushed 'panel shading' effect that you see on a lot of models these days, where the modeller highlights areas of panels with lighter tones to give a '3-D effect'. I prefer to work the other way, with a darkening underlying effect as I never feel comfortable with military vehicles being too bright. Decals - We Don't Need No Sticking Badges! 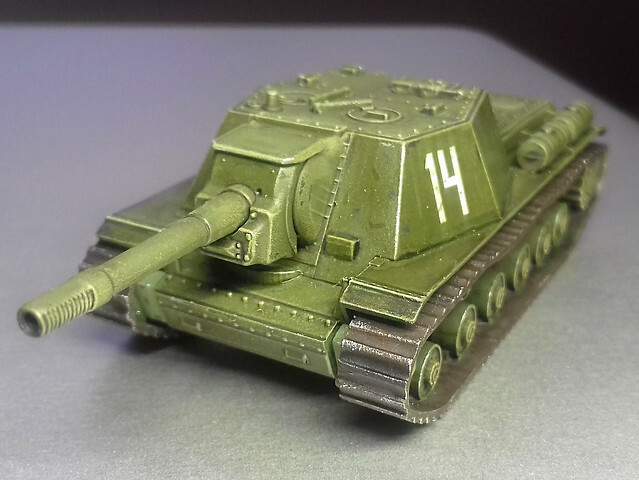 Being a Soviet tanks less is more regarding markings. As far as I can see, the SU-122s in particular - being something of a stop-gap - was one of those Red Army vehicles that only got the most expedient of identifications...Principally a vehicle number. ACE (for one of their kits) and they are generally of poor quality, sadly. 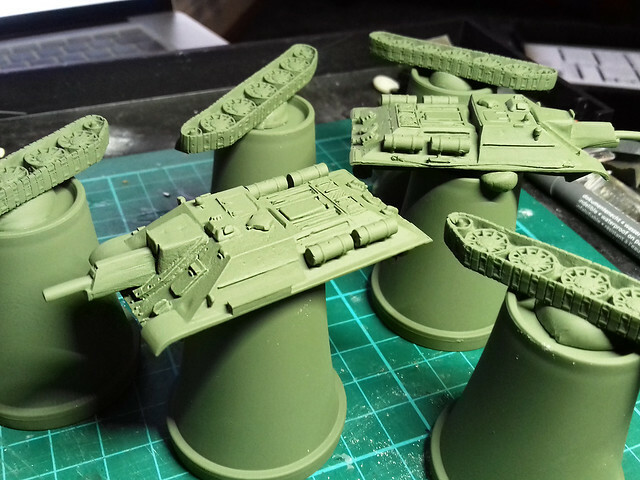 Because these are just for wargaming and indicate examples of types I don't think we have to be too fastidious when it come to markings (they are not intended to be models of specific vehicles from specific units at a specific time). So long as they look the part I'm happy. 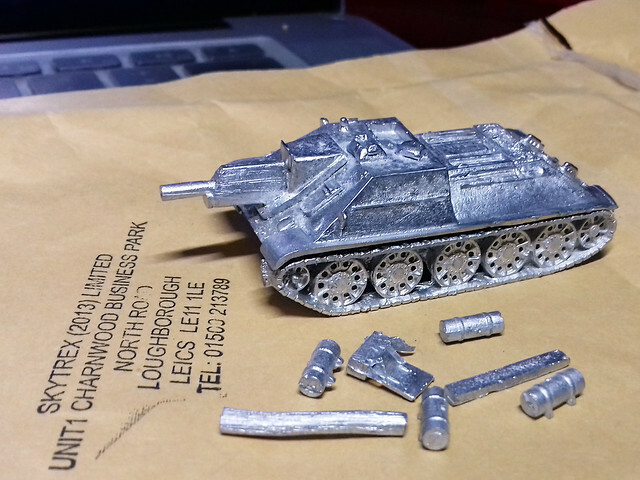 On with the prep work...This is the downside of white metal models and I find it a little tedious. 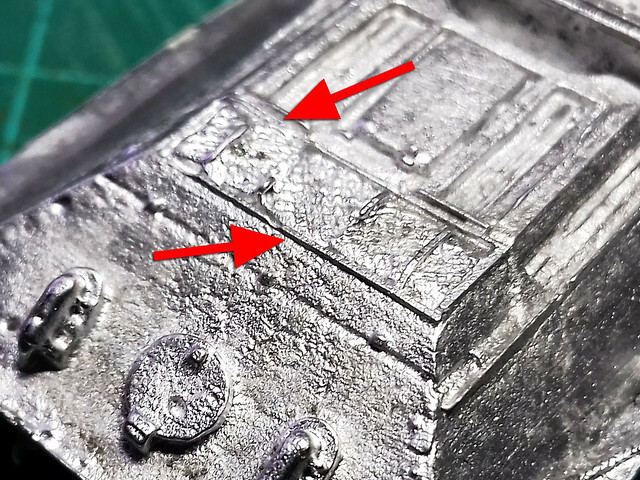 My main grumble about white-metal models is the inherent volatility of molten metal and it's propensity to distort and 'boil' (for want of a better word) during the moulding process. 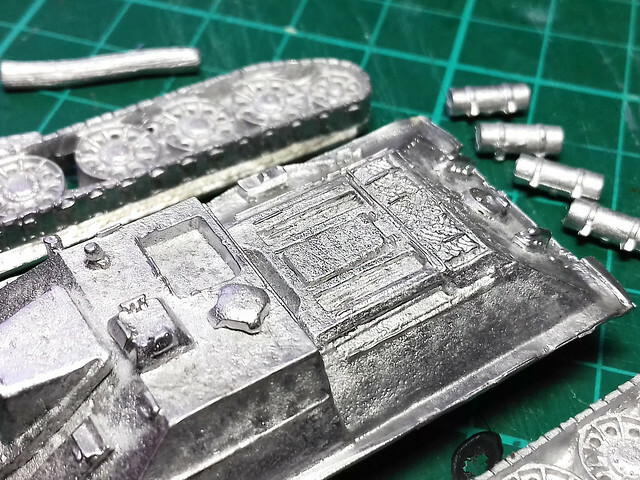 This effervescence of the molten metal during its transition into it's hardened state invariably results unpredictable flaws and blisters...And, sadly, such is the case with my SU-122. This carbuncle of metal 'flash' had to form *right* on the front of the track! Other blemishes on the model - and there are a few - I can deal with but the imperfections on the tracks and the engine deck are very, very frustrating. 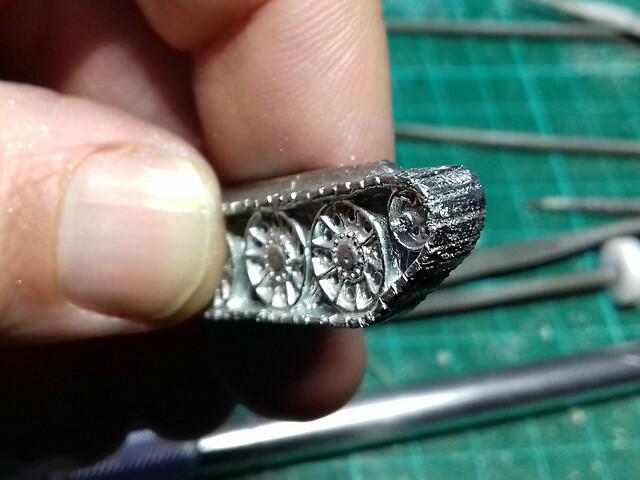 All I can do is smooth the flaws down with a bit of filing and hope for the best (rebuilding the detail again with something like Milliput might be possible, but whether it is worth it when this isn't a display model is debatable). It's the same on both models and is very disappointing. As I said, I don't want to try and rebuild flaws like this using Milliput or styrene strips and filling down in preparation to rebuild might actually do more harm than good. Perhaps a bit of judicious painting might help camouflage the broken detail. Having got everything prepared (there was LOTS of labourious filing) I started to add the extras to the hull using superglue. I was a bit disappointed that the external fuel tanks had to be just glued directly to the surface of the hull - without any guide pins or holes - and the side mounted tool boxes did not fit at all (I had to make my own out of plastic). Also, it turned out that the metal unhitching logs were a bit oversized and looked a little odd so I ended up leaving them off completey. 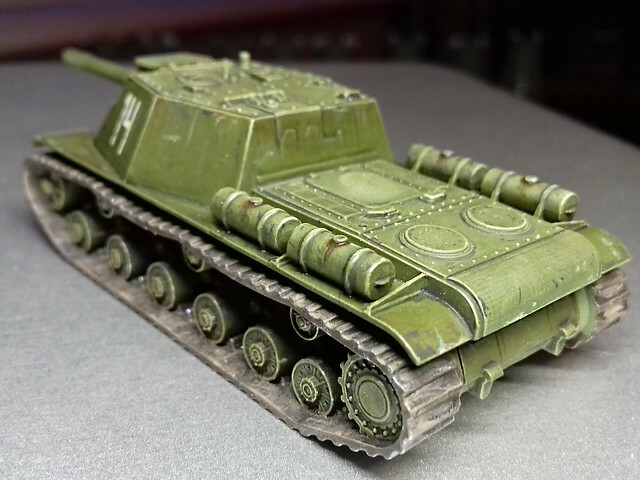 You do have the option to leave off the fuel tanks (reference photos show the SU-122 with and without them) and if you do that there is enough space for adding an unhitching log. But I would still recommend that you make your own log out of thinner diameter plastic rod. 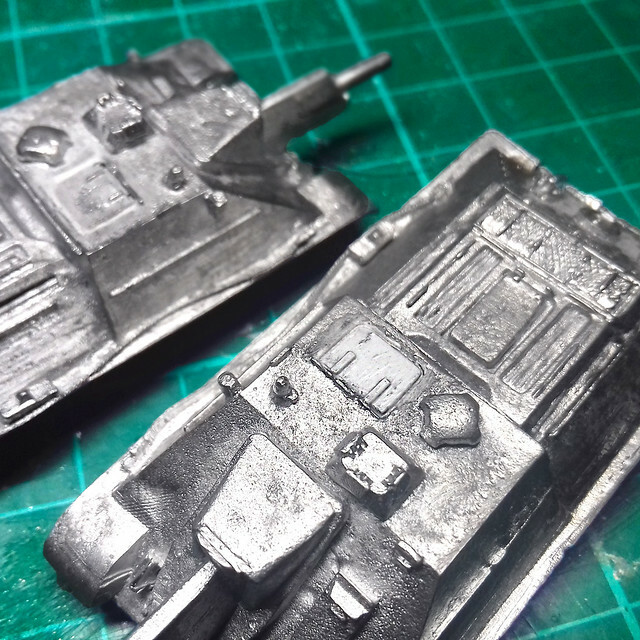 Well, they don't look quite as bad as I had imagined that they might when I looked at these model in the raw metal. Hopefully, as I apply more painting effects they will look even better! I do have to keep reminding myself as these models are intended to be seen at tabletop distance (say, at least two feet away - don't ask me what that is in centimeters). So, we shall see. Next: Operation 'Disguise the shoddy detail with paint' begins! SU-122 in Kubinka Tank Museum. Source: Wikipedia. 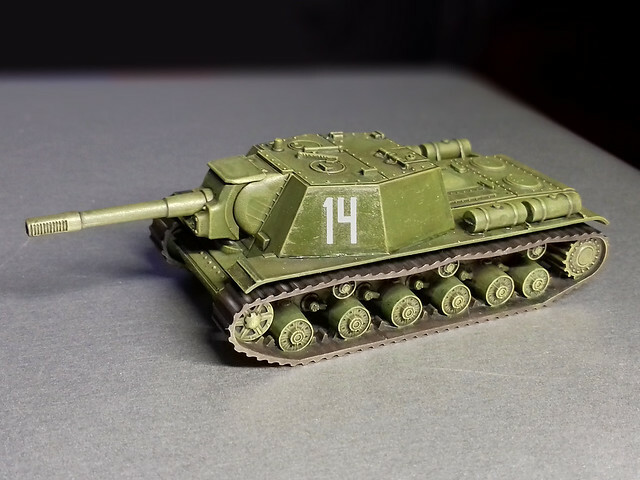 While I wait for some decals I have ordered for my 1/100 T-34s to arrive, I thought that this would be a good opportunity to get started on the last of my mid-war Soviet tank force. 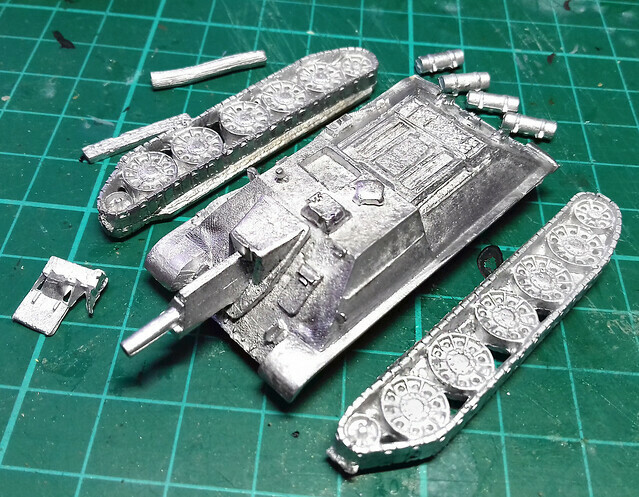 While the Skyrex white-metal wargaming models don't require a lot of putting together, they do need some extra prep work to get them ready for painting. 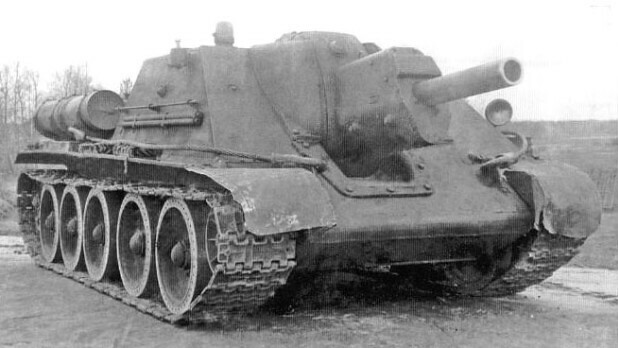 The SU-122 was the Red Army's answer to the highly successful German Stug III assault gun/tank destroyer. 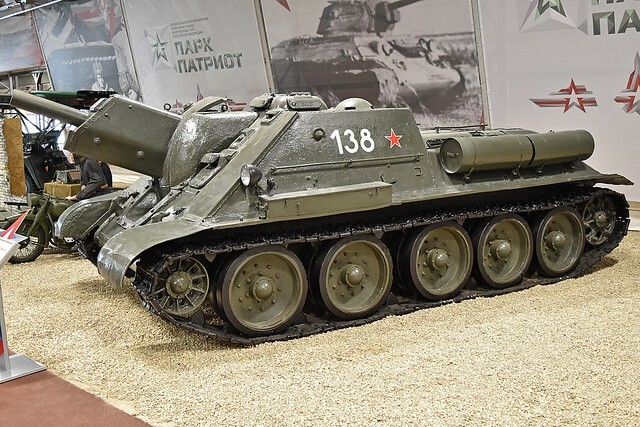 This design of fixed gun housing on a medium tank chassis suited the Soviet's need for large numbers of quick to build and cheap fighting vehicles. The chief advantage of this design was that you could shoe-horn a larger gun into the housing than you could get in the equivalent vehicle with a rotating turret, thus - while normal T-34 designs were mounting a 76mm main gun - this gun carriage could mount a hefty 122mm howitzer! 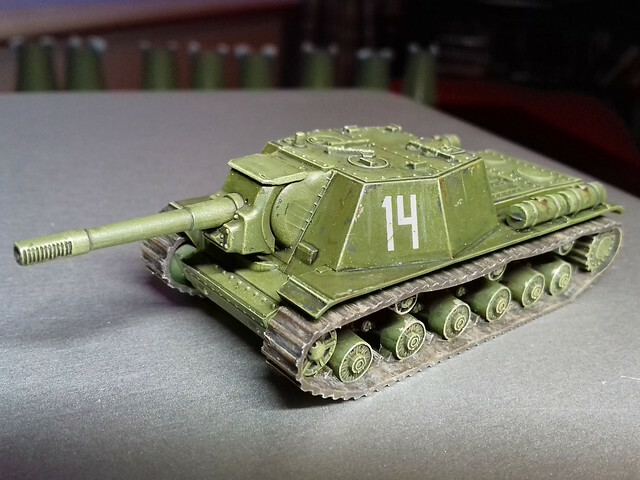 While I would have preferred to have stuck with plastic models for my 'Battle of Kursk' project, sadly none of the main 1/100 plastic kit manufacturers make a SU-122 (and I didn't fancy taking on a T-34 conversion project). So, as I only required two of these models, I dug deep and splashed out on a pair of Skyrex metal models (£6.50 each plus postage). 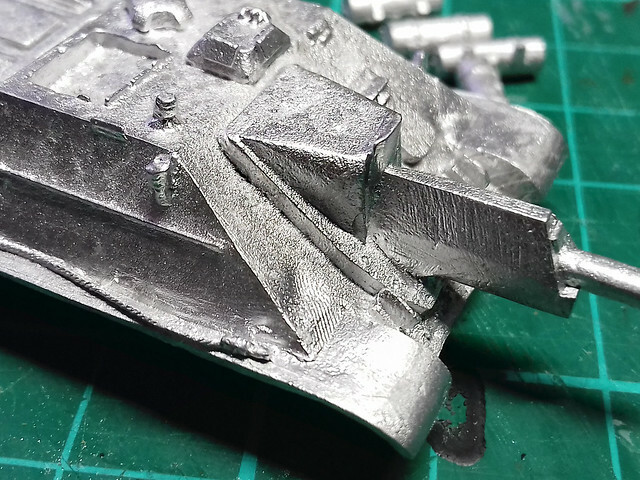 As usual, for a white-metal model, there is a little flash and a tiny bit of deformity so 'cleaning up' mainly involves smoothing out any pitting, bits of flash and scratches with some mild filing and shaving. Additionally, I've been told that it's good practise to give all surfaces a quick rub down with some 'wet and dry' paper to remove any of the moulding medium residue. Because of the lack of definition with some of the detail (particularly the engine deck) I'm a bit worried about how the painting will pan out. 😬 <--- My worried face! Next: Priming, where I should get a better idea about how some of that detail might turn out. It's taking some getting used to working on several similar models at one and the same time. 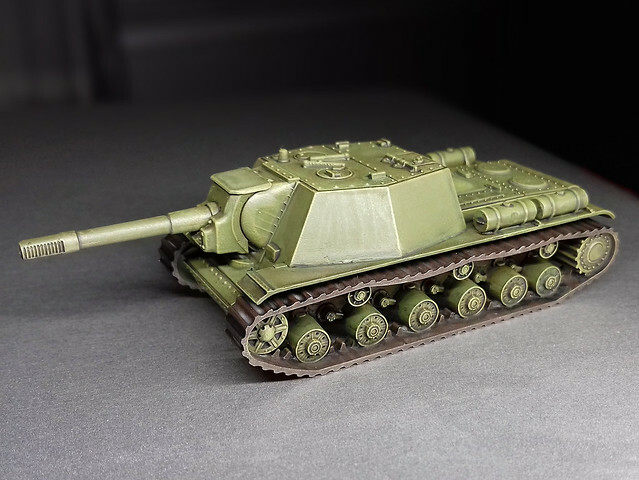 I'm really not sure how people manage to do whole 'regiments' of vehicles for large scale games like Flames of War, I'm finding the repetition tiring with just a troop of four T-34s! The dry-brushed highlighting is somewhat exaggerated for effect (nearly yellow, in fact). But, I'm beginning to get into this whole war-gaming style of painting, though I guess it might be very easy to get carried away. 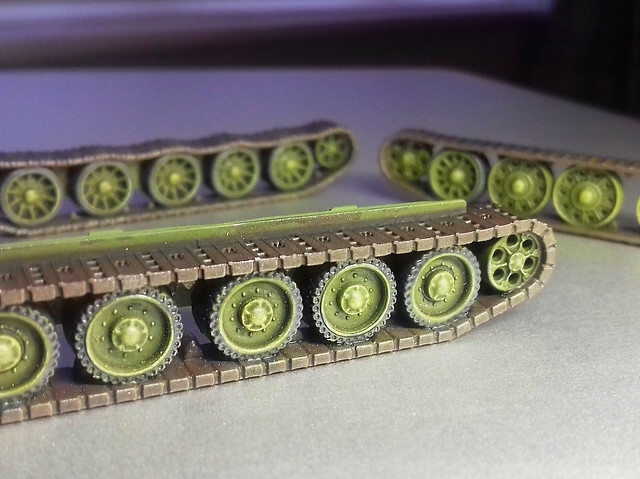 In this case, however, I shall be toning the high contrast down a bit when I add an additional shading wash. Once that is done and I have pin-washed the shadow areas in the wheels I'll start to think about how much - if any - mud and weathering to apply to the tracks. 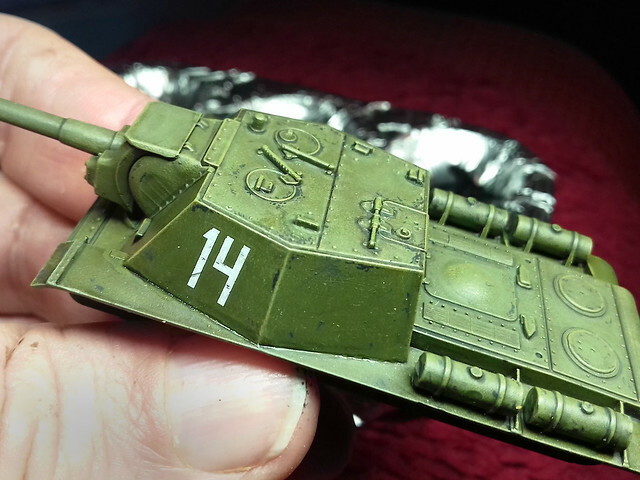 • MODULATION WASH: A quick wash of Vallejo Model Air Russian Green (once I get my airbrush up and going again I will simply prime any Soviet vehicles with Vallejo's Russian Green Primer, thus eliminating a stage). • HIGHLIGHTING: I've begun to highlight in two stages. 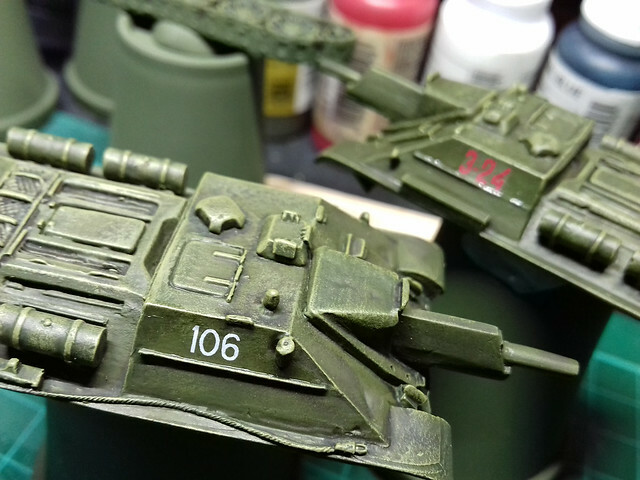 First a general light dry brushing of a Russian Green/Ochre-Yellow mix to give some high-contrast highlights to raised detail and to give some lightening shade to the upper surfaces angels (tops of surfaces). This is followed by a more focused highlighting (near white) on the very most prominent edges and detail (I used a mix of Vallejo White and German Yellow  for this extreme highlighting). • SHADOW SHADING/ PIN-WASHING: Application of Citadel's Agrax Earthshade (over-all wash) and Nuln Oil (focused pin-wash) shading tints to panel lines and any areas I want to deepen in tone. • FINISHING WASH: This is something new I'm trying out. 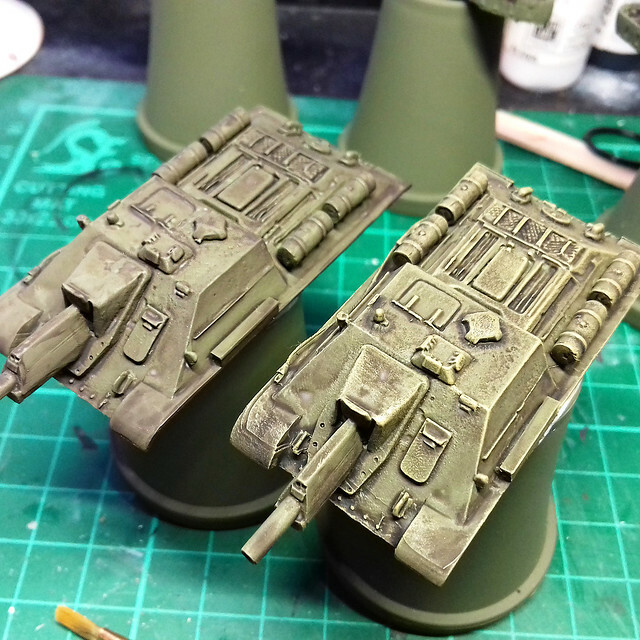 To *unify* all the previous wash effects I finish off with a wash of Citadel's Athenian Camoshade. Let me explain; using multiple layers of washes one onto of another - particularly dark washes - can get a little messy. You can end up with patches and streaks, and so - to smooth out and counter these unwanted blemishes - I apply an overall wash of Citadels darker green shade. It pulls everything together and adds a rich sheen to the Russian Green. Lastly, some of these processes are repeated for effect. For example, I gently highlighted again after the shadow wash/finishing wash or, if a shadow in a panel is not deep enough, I might add an additional shadow wash to that specific area. 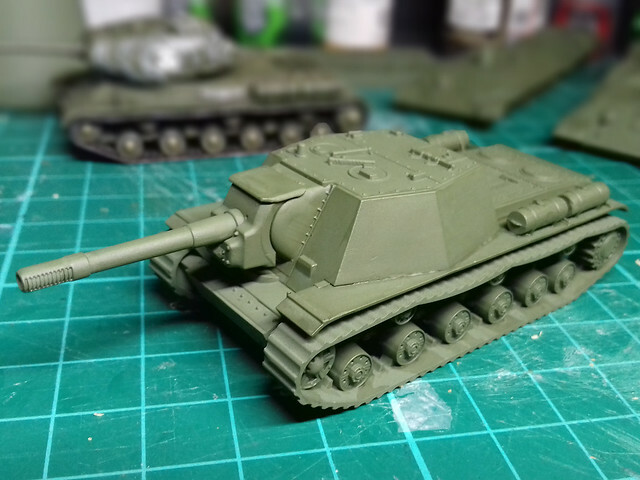 It's been a while since I posted a 'featured work' and I think that's possibly because I've been working in 1/100 scale recently. There are some terrific examples of beautifully painted 1/100 scale armour around if you Google them, but not so many tutorial examples (at least, not as many as - say - 1/72 scale tutorials anyway). 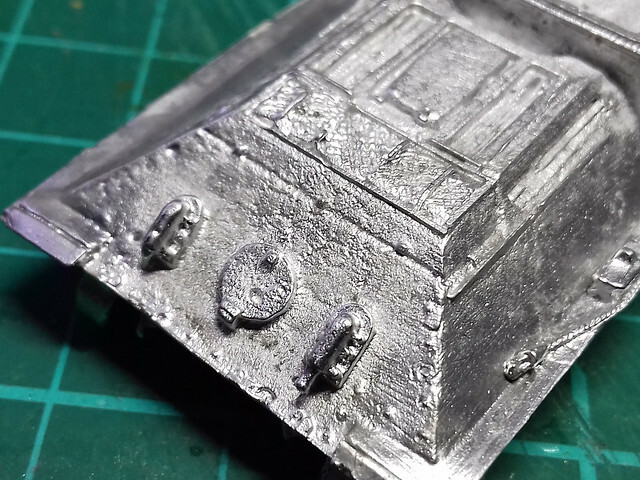 Computer games aside, though, this is a very useful tutorial on with some very interesting pointers about advanced painting techniques for 1/100 armour. 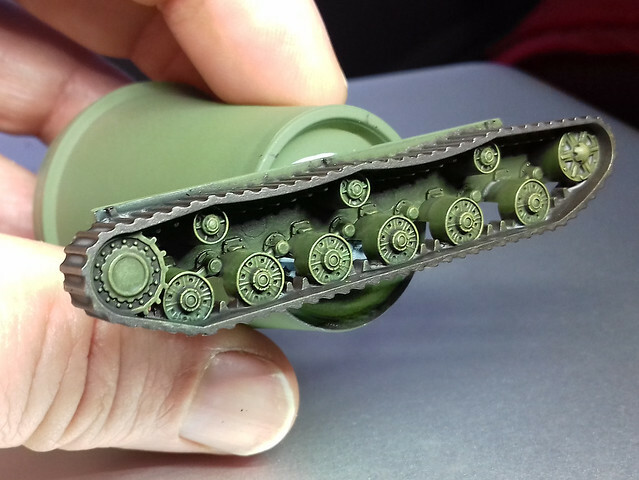 I'll undoubtedly be trying out some of these tips in the various tanks I'm just producing. Well, this project isn't going to take long! Next I brush on a dark brown wash of Citadel Agrax Earthshade (slightly diluted). But, be careful, as this wash doesn't seem to like too much water added and will sometimes dry with a white residue. I've been told that to avoid this you should dampen the surface you are applying the wash to first. details of the road wheels in particular. On top of this I dry-brush a highlighting colour of Vallejo's Model Color Yellow Ochre  (mixed with a little Vallejo Model Air Russian Green for effect). This is just to make the most prominent detail 'pop' out a bit. defined and shaded. I may re-highlight a it, but otherwise onwards we go! These stages repeat the wash, highlighting and pin-wash processes described above. This stage is very subtle so I've skipped photographic it. BUT, it is worth doing as once the next stage of shading wash has been applied it gives some very subdued highlighting to raised edges and panel lines. 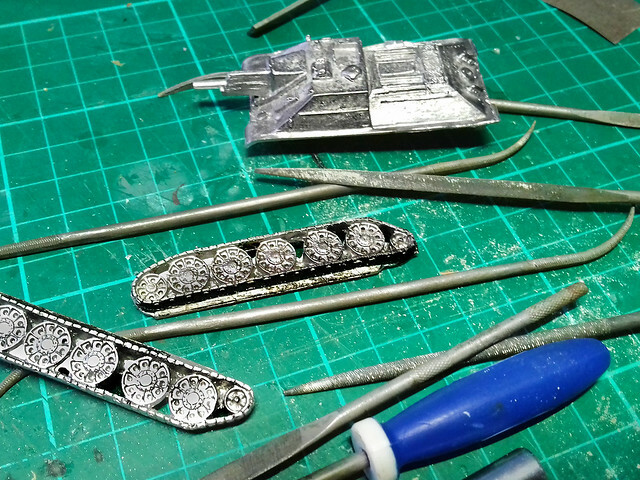 With the pin-washing done, this brings the hull and the tracks to the same stage of basic painting. 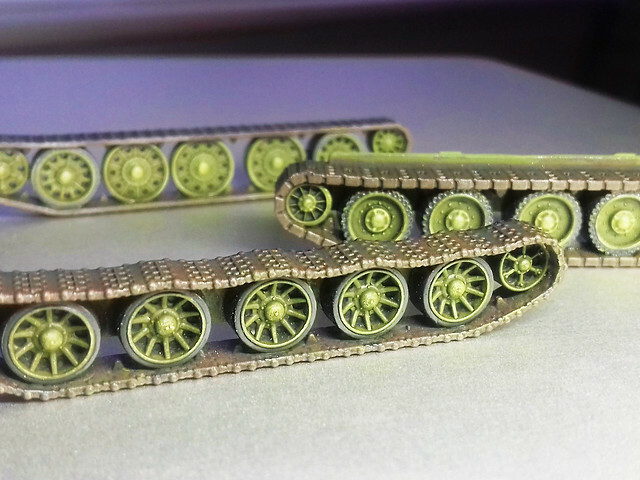 I'm not basing this tank on any specific historical vehicle, so the decals are just to add character to the model. I begin by a flicking through my collection of spare decals and found a set of - appropriately - large Cyrillic numbers ('14') that I thought would compliment such a big tank. Sometimes less is more with Red Army armour! As this is a war-game model there will be plenty of character about it, and this includes a slightly exaggerated amount of weathering. This is definitely 'just for fun' and not strictly historical. needed. I shall decide when I see the finished model. And finally, I'll add a few grime, stain and oil streaks to the hull and slightly discolour the decals to get rid of that 'new' looking brightness. (Edit: I thought the tracks looked a bit flat - in tone - so I added a wash of Vallejo's Game Color Wash in Sepia Shade . This added a nice tinge of rust to the bare steel of the track links. this case it's Tamiya's Weathering Sticks. I think I prefer powders. Well, I just can't resist tinkering and I did some more chipping and streaking. But that's normal with me - I just can't leave well enough alone! I'm fairly pleased with this model, though a little disappointed with how the tracks turned out. It's perhaps half to do with how simplified the tracks were - offering scant detail - and half my poor 'mud' painting technique (I shall have to practise with some other medium). 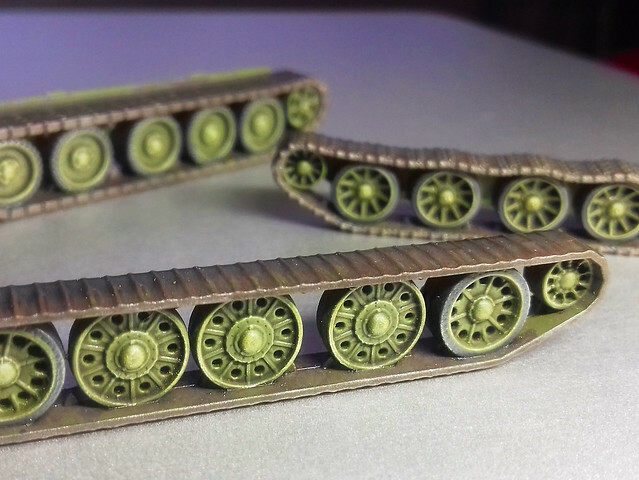 But, let's not get too negative...This is a perfectly fine war-game piece for GF9 Tanks, and that's the main thing. All that's left if to varnish the model. I'll probably go with several light coats as it's intended to be handled. 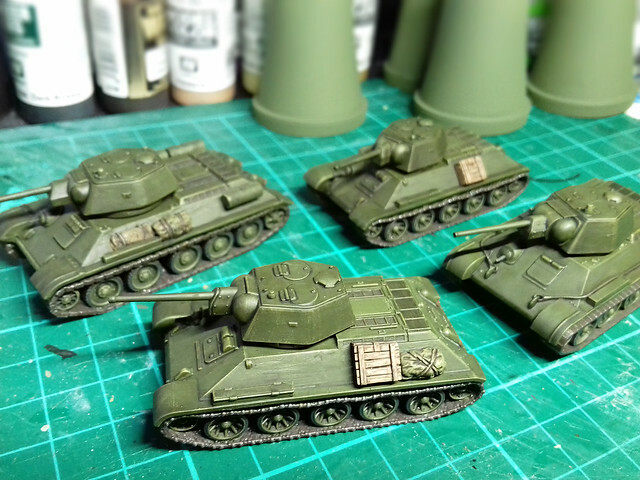 Other than that, it's on with the next models in this project - my T-34s. 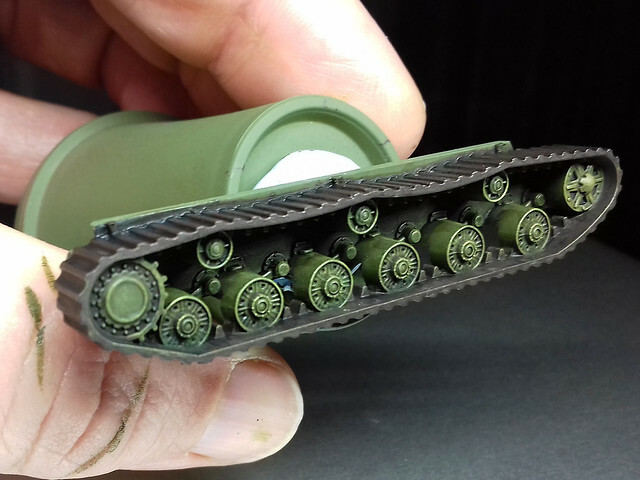 New 1/35 & 1/48 kits from Bronco Models!